Explore the arctic with us at summer time. Experience magnificent nature and scenery in the land of the midnight sun. From mid-May to late June, the sun never sets. Choose yourself how you want to explore; with boat, kayak, e-bike or on your feet. With NORD Ekspedisjon you can experience the great fjord by RIB. We can offer a variety of trips: from transportation and sightseeing to "Catch of the day" and hiking trips on Seiland National Park. 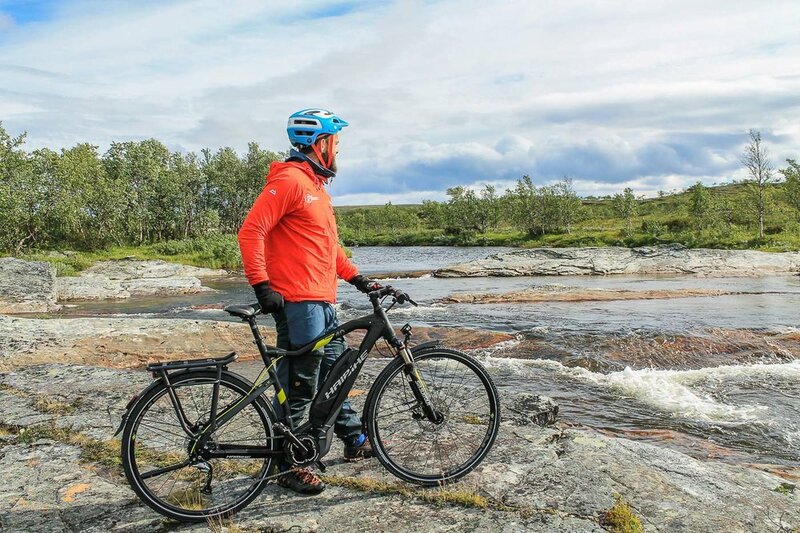 Try a guided trip with electric bike! It's fun and exciting. The electric engine makes It easy to ride a bike, use your energy to enjoy the beautiful landscape and surroundings instead. This is a trip we highly recommend. Rent an E-bike from us and experience Alta on Your own. Electric bike is easy to maneuver and it is a fun and exciting experinece. The electric engine makes It easy to ride the bike so you can use your energy to enjoy the beautiful landscape and surroundings instead. Do you like to be out in the wilderness and want to go kayaking? On this tour you will explore the Wildfjords of Finnmark and Troms and padle towards the majestic Øksfjord glacier. Seiland is a magnificent island far out in the Altafjord. The island is very lush and green, han has a great Wildlife. We go ashore and take a walk along the beautiful Milkyriver. Lunch and hot drinks included. A visit here is definitely recommended. Join us for this 2,5 hours trip in inner Atafjord. You will have a safe and fun ride, and the gide will tell you stories from Alta. Do you want to join us for a trip to explore the Wild fjords of Finnmark and Troms and also have a glimpse of the majestic Øksfjord glacier? From mid-May to late June, the sun never sets in Alta. Experience this unique phenomenon with NORD Ekspedisjon. We take you on this easy walk from the city center to one of Altas best viewponints. Do you want to go for a walk to one of Altas best viewpoints? On this 4,5km arctic wandering trip we leave the city and head down towards the fjord via our viewpoint and several historic landmarks on the route.We will end up by our fireplace where we will enjoy the silence and make a fire. If you didn't find the experinece you were looking for, please contact us and we will create a trip customized for you. Are you travelling alone or in a bigger group, we can handle your request. We want to create great arctic memories for you! On all of our tours and activities we can offer you a photo package. We take care of your memories, you enjoy the great landscape with your own eyes, and not trough the camera lens. Get in touch for more information.